Six Nations Guide Sports Performance Ideas & News Guide! It is reported that 4 out of 5 westerners consume caffeine on a daily basis, a greater proportion than those consuming fruit. This is largely due to the fact that the drug is present in far more food and drink than we may be aware of. Caffeine’s prevalence in everyday goods such as tea, coffee, soft drinks and chocolate is one of the reasons why the World Anti-Doping Agency (WADA) removed it from their banned substance lists. Since caffeine’s removal, it has been the focus of many studies as athletes seek marginal gains in performance. With recent developments in caffeine chewing gum, it has become easier for athletes to regulate their caffeine intake and tailor it according to their training schedules. Experts advise 3mg of caffeine per kilogram of bodyweight as the optimal dosage – which roughly equates to three large cups of filter coffee – taken one hour before exercise. 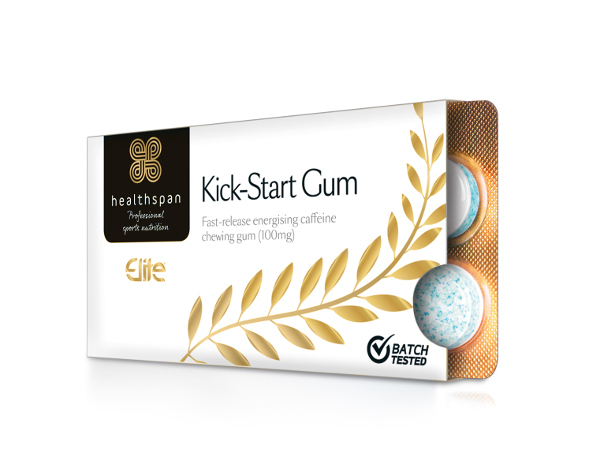 Healthspan’s Kick-Start Gum, vegan-friendly and gelatin free, delivers 100mg of pure caffeine absorbed through the lining of the mouth with 85% absorption in 10-15 minutes and the peak performance window thought to last between 40-60 minutes. How Does Caffeine Help Us During Exercise? As you exercise, the body produces adenosine which causes feelings of fatigue. Caffeine intake blocks adenosine receptors in the nerves so that the brain perceives less fatigue allowing athletes to exercise longer while feeling more mentally alert, lending itself to endurance sports such as cycling and running. The stimulated nerve cells release the hormone epinephrine (adrenaline), which increases heart rate, blood pressure, and blood flow to muscles. It is by no coincidence therefore that caffeine can be used as an ergogenic (performance enhancing) aid for endurance performance. “Gum format is the preferred ingestion method of the British Sailing Team as it allows us to have the greatest control over when it gets implemented,” said Paul Mullan, Head of Sport Science at British Sailing and Healthspan Ambasador. 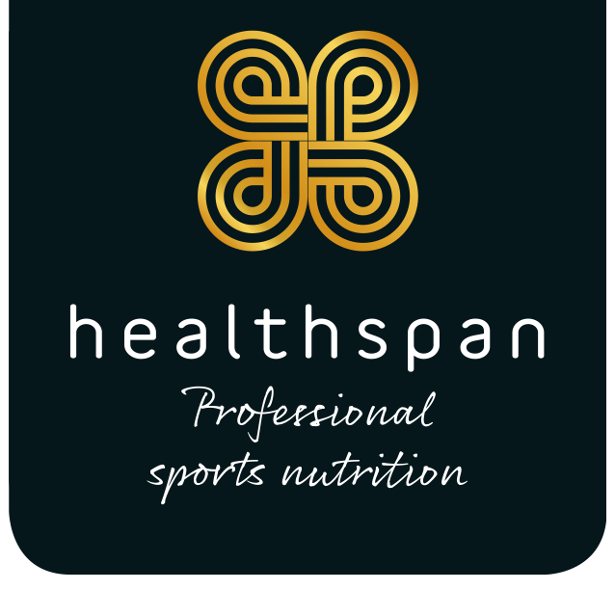 “Healthspan’s Kick-Start Gum is perfect for our athletes. It allows us to get a controlled dose, just when we need it to give our athletes a performance edge. For me, it’s the best tasting and highest quality caffeine gum available. In order to consume a more precise and well-timed dose of caffeine, elite and competing athletes are opting to use caffeine gum offer more traditional sources. Kick off the Six Nations Championship with Aldi’s new Six Nations range, available in stores and online www.aldi.co.uk/c/specialbuys/sports-and-leisure from 28th January, days before the tournament officially starts. 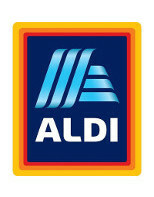 Fans heading to the games can get kitted out from head to toe with Aldi’s ultimate supporter bundle, available for English, Scottish and Welsh fans alike. This Rugby Rain Jacket (£19.99), a Rugby Hoody (£14,99), complete with a handy front kangaroo pocket to keep hands toasty, a Rugby T-Shirt (£6.99) and this Rugby Beanie (£4.99) are on sale for under £47 and are embellished with the team crest logos. Available in sizes small to XXL, this Rugby Long Sleeved Top (£12.99), featuring a classic collar and V-neck design, can be paired with this Rugby Fleece (£12.99), specially made from 100% polyester micro fleece to provide extra comfort whilst cheering on the players this Championship. The kids’ don’t need to miss out, too, with this matching mini-me Children’s Rugby Top (£8.99) – a cotton jersey with a classic button and collar design – perfect to wear whilst supporting from the sofa. If you’re lucky enough to be watching live at the stadium, little ones can layer up with this Children’s Rugby T-Shirt (£4.99) and Children’s Rugby Hoody (£9.99) – just the thing to keep the cold at bay whilst supporting! 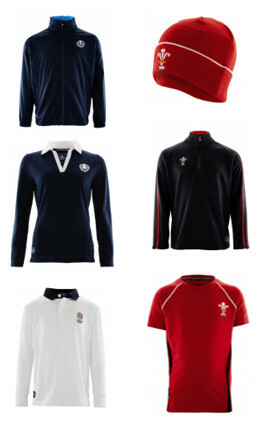 The full range of Aldi’s Six Nations range is available in stores and online from 1st February, available whilst stock lasts. According to the Professional Rugby Injury Surveillance Project, there were 447 match injuries that led to time lost from training and/or match play in the 2015-16 English professional rugby season. Encouragingly, there was a fall in match injury incidences but it remains a dangerous sport, with injuries to the knee – specifically Anterior Cruciate Ligament (ACL) and Medial Collateral Ligament (MCL) injuries – still some of the most common, only exceeded by concussions. Just recently, Rhys Webb was ruled out of Wales’ Six Nations team with a knee injury. Most knee ligament injuries occur unexpectedly, from someone landing on a player’s leg in a ruck whilst their leg’s in an awkward bent position, or from tackles from the side where the tackler’s shoulder impacts on the side of the player’s leg, where the forces involved can be huge. In terms of what to do once you sustain a knee injury, Mr McDermott advises: “The most important thing is to take knee injuries seriously! Fundamentally, with any significant injury, you should get it looked at properly, and if there’s any concern about anything potentially serious then the best thing is to be seen by a specialist (an experienced physiotherapist or a specialist knee surgeon) and to have a high-res high quality MRI scan (a 3T MRI) — to see exactly what the potential damage actually is. “If you’ve damaged your knee, you also need to consider very carefully the timing of when to return to play after injury. You should listen carefully to your knees, be gentle with your joints and avoid anything that hurts or aggravates your symptoms in any way,” Mr McDermott concludes. 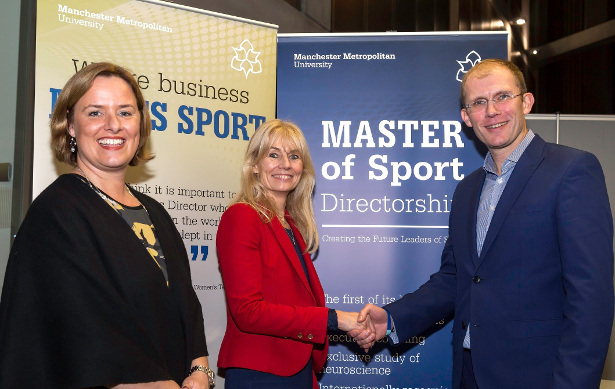 Rugby League’s national governing body, the Rugby Football League (RFL), has commissioned Manchester Metropolitan University Business School to develop a purpose-built leadership development programme that will improve governance among its management team. The bespoke course will be based on the business school’s acclaimed Masters of Sport Directorship (MSD), which qualifies its students for the role of sporting director and has attracted a host of high profile professional sports people including St Helens RFC CEO Mike Rush and Mark Bitcon, director of performance at Wigan Warriors. Under the RFL leadership programme, a group from the organisation’s leadership team will take part in a series of intensive workshops at Manchester Metropolitan University Business School throughout 2018, interspersed with periods of workplace implementation. Teamwork, coaching and mentoring, change management and leadership will all be covered on the programme. RFL finance director, Tony Sutton, said: “As Rugby League’s national governing body we are clear that we want to invest in our people so that we have continued excellent leadership that will future proof us as an organisation and enable the RFL – and all levels of the sport – to operate as effectively as possible. Stephanie Sturges, programme leader at Manchester Metropolitan University Business School, said: “The RFL has made an innovative move to improve its sustainability and the quality and robustness of its leadership structures. Rugger-fans rejoice! If you didn’t manage to bag yourself a seat at the Six Nations, don’t fret, as this year Young’s will be delivering all the atmosphere of Twickenham from the comfort of your local, complete with great beers on tap. Enjoy unrestricted views, meet like-minded people and discover a new favourite as you enjoy the game of gentlemen from 3rd February – 17th March. If that wasn’t enough, Young’s is teaming up with Rugby greats, hosting a range of exclusive events and offering one lucky the person the chance to bag the best seat at Twickers in partnership with Guinness®. Beat the crowds and enjoy pre-match fever with a Guinness® hosted brunches available at selected pubs. Enjoy dishes such as a full English breakfast or small plates from smashed avocado with poached egg and sour cream on sourdough to smoked haddock and wild rice kedgeree all washed down with two pints of the black stuff, from the exclusive pop-up Guinness® bar. Scrum on down! Check out www.youngs.co.uk/events to see what your local pub is doing to celebrate the Six Nations. Ross Steiner, THE Personal Trainer for Trainers and Athletes and founder of Steiner Strength Method — Ross works with a many Rugby players, male and female and can speak to the training methods and diet and nutrition set in place to help shape the best rugby players. Ross has also worked as a sports performance coach with Stanford University football, Mission High School Football and hundreds of individual athletes has fully developed his strength and conditioning knowledge base and allowed him opportunities to work with D1, NFL, and elite level athletes such as Andrew Luck, Coby Fleener, David Decastro, and Jonathan Martin. With over a decade of experience in the fitness industry, Ross helps clients and athletes maximize their potential in achieving higher levels of performance in both their fitness and their daily living. 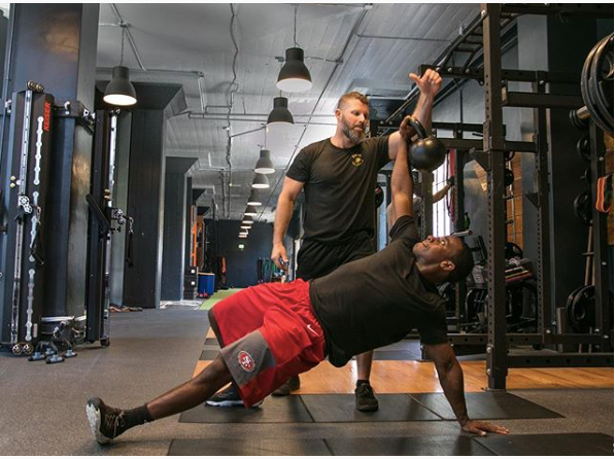 Ross closely monitors each client’s program, making adjustments as needed, in order to precisely push and motivate clients to obtain optimal results without injury. He compliments each training program with a customized nutrition strategy built to aid in the achievement of every client’s performance goals. Through extensive research and personal analysis of a wide range of nutritional programs, Ross advises clients on the most efficient dietary adjustments to make for developing strength and muscle mass while reducing body fat. Ross is also a coach, mentor, and lecturer to his peers and other coaches in the fitness industry. As one of the four fitness industry leaders to create The Business Movement in San Francisco, Ross inspires and instructs aspiring entrepreneurs and young coaches on making their best business decisions in the development of their private practices. His development of The Steiner Strength Mentor Program provides beginning level coaches with the opportunity to observe and study under Ross, while learning his philosophy, craft, and programming style, before eventually training his clients and athletes under the guidance of his watchful eye. With the new year, ‘new me’ and imminent return to Rugby and many other high intensity sports, it is common to experience a muscle strain and debilitating tears. Hamstring injuries remain a frequent frustration for sporting individuals, significantly impacting Sunday league, all the way to elite level athletes. Recent evidence suggests that hamstring tears account for 12-16% of all athletic injuries. Hamstrings are a triad of muscles which span the back of the thigh, aiding in bending of the knee and extension of the hip – particularly useful when accelerating and decelerating in high intensity sprinting, such as in Rugby. Unfortunately for the athletes (no matter how fit), a hamstring tear is a common injury involving a tightening and/or tear in one or more of these muscles. This may occur when fatigued and nearing the end of a game, full out sprinting and/or slowing down rapidly. – Pain / tenderness localised to the back of the thigh and/or lower buttock. – Pain reproduced with walking, sprinting, bending over, bending / straightening of the knee. – Swelling and or bruising may be evident. – An audible “pop”, “snap” when the hamstring goes. – Reduced weightbearing on affected limb. – Return to light cardiovascular fitness – light jogging for e.g. – at 50% intensity of your maximum; maximum = full out sprinting. Can be completed up to 15-20 minutes in the days building up to the first training session. 1. Dynamic stretches moving through range, accompanied with static stretches. 2. Initial jogging building up to full out sprinting in preparation for the 80 minutes. 3. Practicing sport specific drills: Footwork, Kicking, Passing, Tackling. – Continuing with and or beginning strength & conditioning programmes for the hamstrings, as well as surrounding muscles. 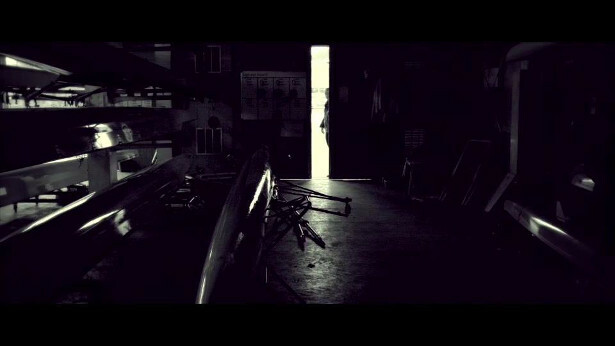 Many ingredients go into making a world beating performance; Motivation, Drive, Commitment, Discipline, Heart, Power, Endurance, Blood, Sweat and Tears. 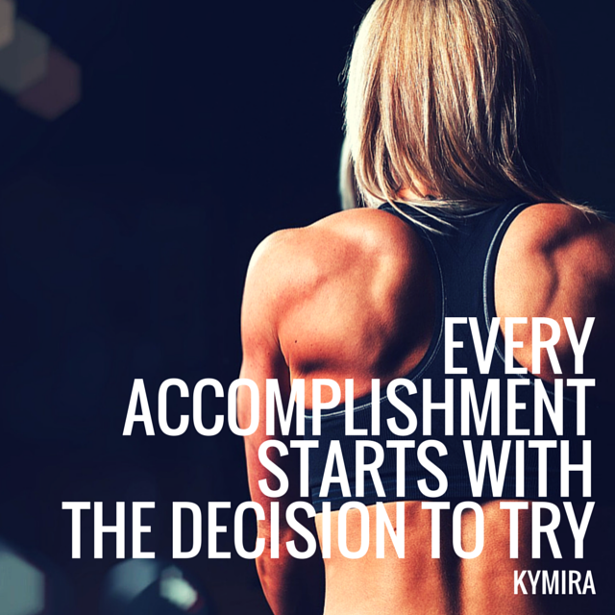 But now there is a new ingredient… KYMIRA sport! Infrared performance and recovery sportswear, made from our innovative KYnergy fabrics. 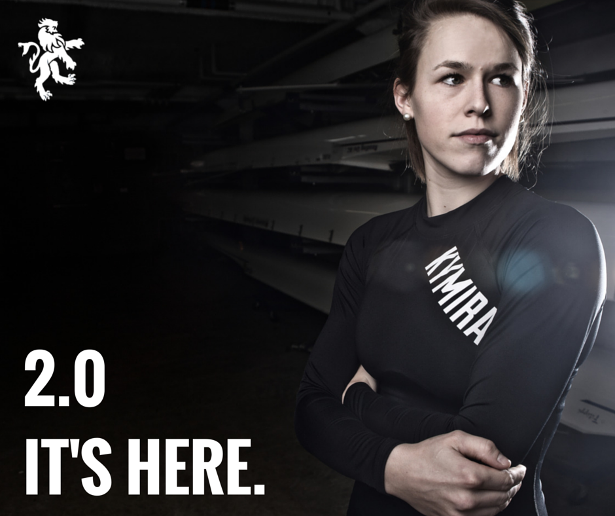 KYMIRA sport offers infrared performance smart sportswear used by a number of pro athletes to help improve performance during training. 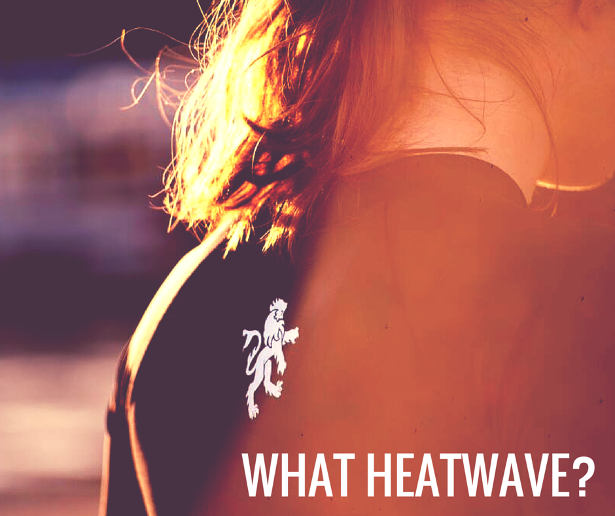 The infrared technology is woven into the fabric to help increase circulation, increase respirational efficiency, increase tissue oxygen levels, offer pain relief and helps reduce ‘The Doms’ (delayed onset muscle soreness) if worn half an hour before exercise, during and an hour after. 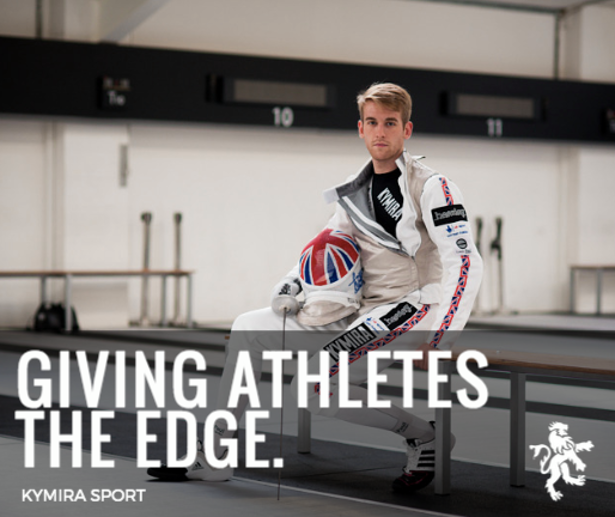 The garments allow athletes (and sporting enthusiasts) the ability to push their training harder, go further and recover quicker! 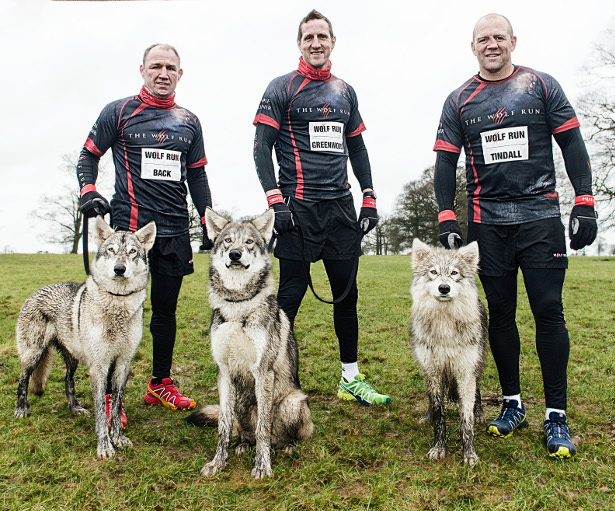 29th January 2018: England 2003 Rugby World Cup heroes Mike Tindall, Will Greenwood and Neil Back are getting back together to take part in a brand new Wolf Run obstacle challenge at Pippingford Park, East Sussex on Saturday 28th April. 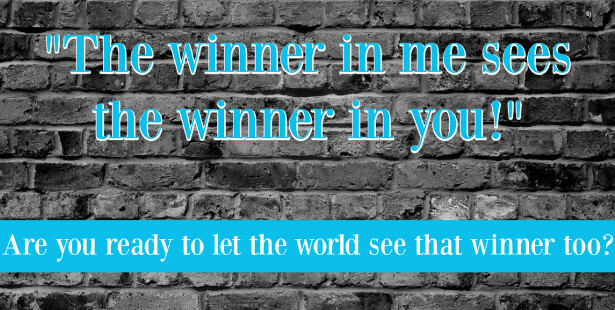 This call is designed to help every athlete and high performer unleash the winner within, we know that winning isn’t just an outside game but an inside one too and that’s where this call comes in. The call is all about digging into you, digging into the person inside and understanding how to fine tune and use your mind to unleash your winning performance everytime. We also work together to put in place the rituals which will enhance your life, training and performance. If you’re looking to enhance your outer training and combine your inner self to really harness your power and produce your best performance and ultimately win then this will be the perfect call for you. Take a swing at something different! Desperate for a new and exciting way to spend time with your friends and loved ones? Look no further than Topgolf, the premier entertainment experience that inspires connections and brings people together. Through point scoring games, good food, drinks and music, Topgolf fuels life long memories regardless of one’s age, gender or skillset. So how does it work? Players are invited to play addictive point scoring games whilst enjoying an assortment of mouth-watering food and drink options either while they play or after in the relaxing restaurant. Topgolf, the signature game, enables players to aim microchipped golf balls at giant dartboard-like targets on an outfield and receive instant feedback on the accuracy and distance of their shots. Topgolf also offers a variety of other games to choose from including TopBreak, TopChip, TopShot and TopPressure and has PGA instructors on hand to help you brush up on your skills. Whether you’re planning a hot date, a work event or a fun-filled family day out, Topgolf Watford, Chigwell or Surrey has everything covered. Combining the competition of sport with your favourite local bar, Topgolf inspires everyone – even non-golfers- to come together for a little playful competition. Rachael Burford, Harlequins and England Rugby Player. Fruit Bowl the irresistible, intensely fruity kids snacks, have launched a new campaign to get kids active and eating more healthily, inspired through sport. To celebrate and acknowledge the start of the Six Nations Rugby Tournament, they have are offering a competition for primary aged children across England. 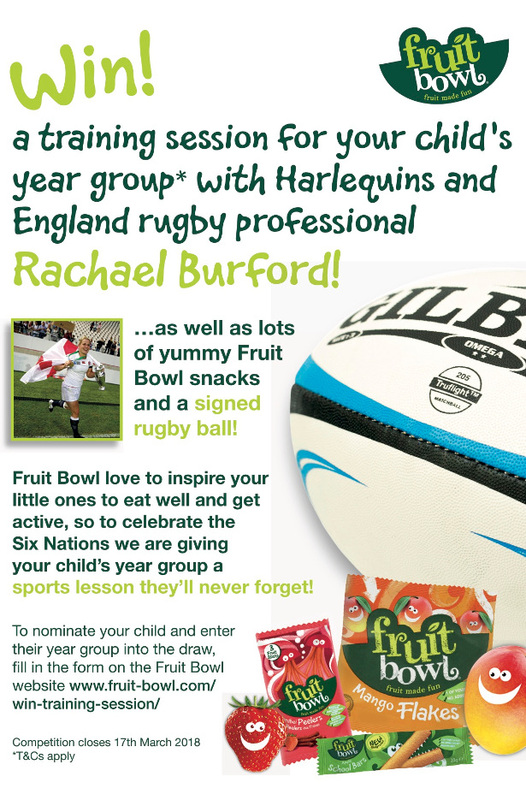 One lucky school will win Fruit Bowl snacks for an entire Year Group, PLUS the Harlequin Ladies and England Rugby player Rachael Burford to come and coach at their school, and a signed rugby ball for the winning child. 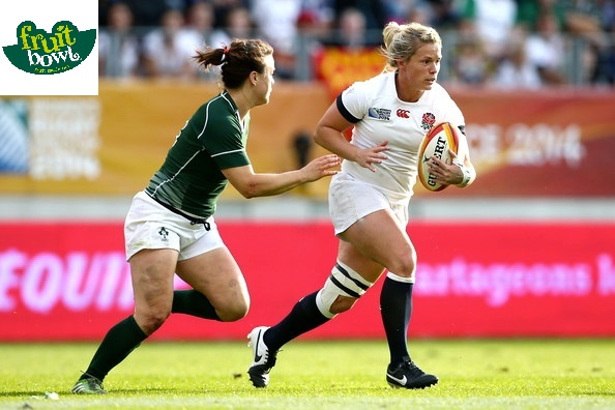 Rachael was one of the first women in English history to become a full time professional rugby player in 2006. More than a decade on, and she is far from swinging low…In fact, Rachaels’ chariots are gleaming as she still plays for England, as well as her mentoring, coaching, public speaking and the launch of her “12” and The Burford Academy. England Fullback Ben Foden joined selected rugby fans from across London to share Rugby banter and a pint to kick off England’s first Six Nations game against Italy. 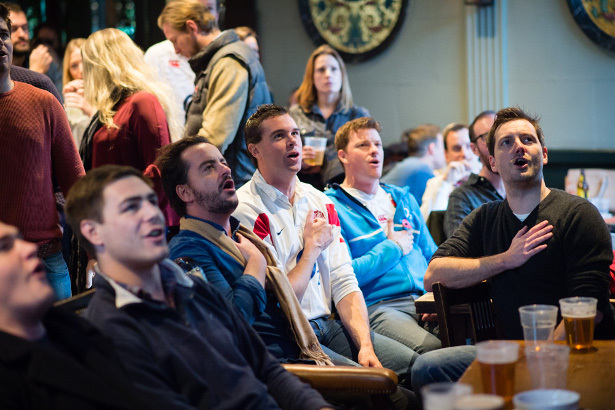 Several lucky rugby fans were be given the opportunity to come down to The George Inn, London Bridge to watch the opening game of the world’s most anticipated rugby event. Fans were able to share their thoughts on the upcoming tournament, partake in a spot of customary banter and enjoy a couple of pints with England and Northampton star Ben Foden. 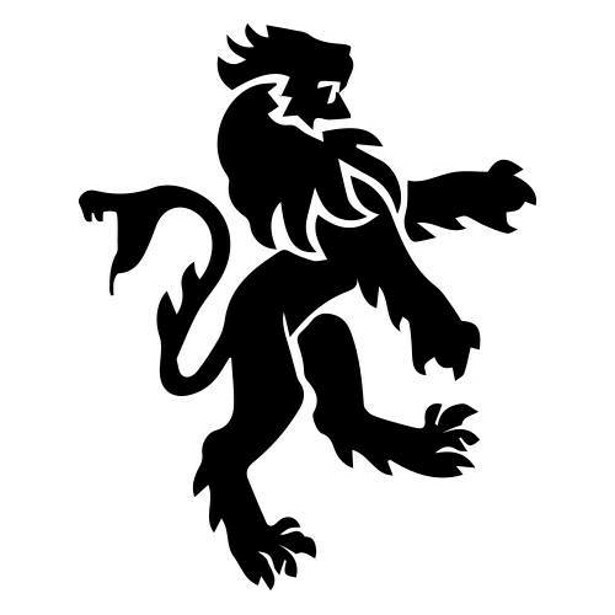 Fans were given the chance to attend via Greene King’s social media pages and selected at random after a call out for rugby enthusiasts to tag a mate they would most like to watch the game with. 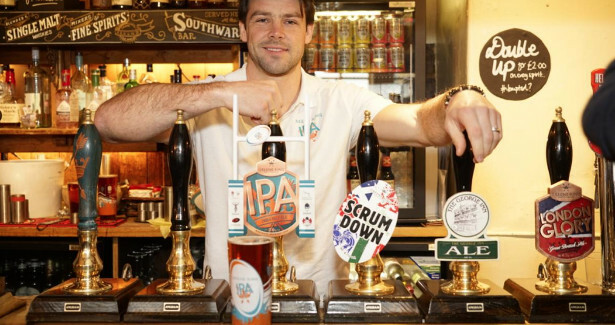 Ben Foden’s England experience made him the perfect company for fans invited by Greene King with a view to bringing fans together as the Supporters’ Supporter. Ben Foden said, “It’s all about watching the sport that you love the most alongside other people that love it as much as you do! It’s great to be here with Greene King sharing the experience of such a huge tournament with a bunch of real rugby supporters”. Coconut water is not only delicious, it’s also known as nature’s sports drink. Nutritionist Anita Bean and media medic Dr Sarah Brewer reveal why coconut water is a great rehydration source after exercise and how its components help quench our thirst after vigorous workouts. The coconut trend is here to stay. Even years after it was first introduced as the new health ‘must-have’, we’re still going nuts for coconuts. Many love the drink for its deliciously fruity taste, however it’s also been found to provide a great choice for the exercise-conscious looking for a natural alternative to traditional sports drinks. What does coconut water actually consist of? Coconut water is a clear liquid extracted from young coconuts. The water contains potassium and vitamin C and has naturally occurring sugars. It’s also fat free and low in calories. So the next time you’re reaching for a drink that’ll quench your thirst, try going for a low sodium alternative such as Vita Coco’s Natural Coconut Water that contains just 0.04g per 100ml instead of your usual sports drink for a delicious, naturally hydrating drink. Anita Bean is an award-winning registered nutritionist, health writer, internationally published author and champion athlete. She specialises in sport and exercise nutrition, has authored more than 20 books and is the nutritionist for the Virgin Money London Marathon. In terms of ways to maintain good hydration throughout the day, media medic Dr Sarah Brewer provides tips on how to incorporate more fluids into our diet through our food choices. Dr Sarah Brewer is a medical nutritionist, nutritional therapist and has authored over 60 health books. Sarah has a degree in Natural Sciences, Medicine and Surgery and has worked as a hospital doctor and GP. 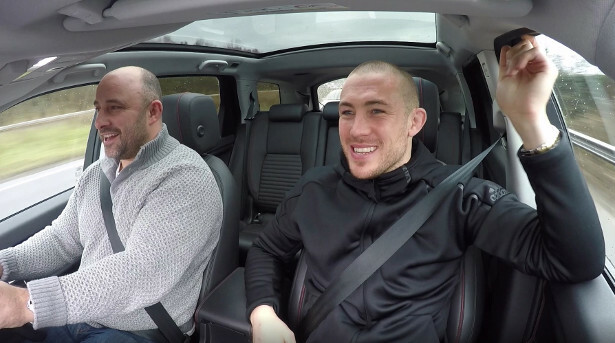 Driving Mike Brown to collect his Range Rover Sport, Flats takes the opportunity to get under the skin of what makes Brown tick and discusses peoples misplaced assumptions of Brown as rugby’s angriest man, as well as gaining exclusive insight into how the game has moved on since ‘his day’. 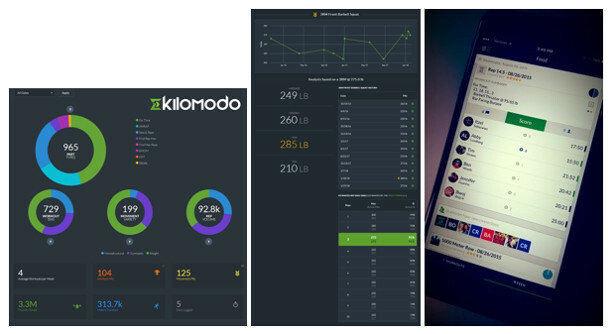 Kilomodo is a mobile workout tracking application focused on data analysis and connecting athletes around the world. The platform is applicable to all types of fitness but is extremely user-friendly for creating workouts, analyzing results and celebrating accomplishments. It is capable of tracking all movements in a workout and creating performance metrics through an engaging dashboard visualization that has proven to keep athletes achieving their fitness goals. The data analysis can reveal trends and patterns in an athletes programming and is the most adapted application for all types of athletes. It is an international platform and developed for every type of athlete. From a beginner to a professional, everyone should be tracking their workouts and this is the system to do it with. Leicester Arena is to play host to World Champions and Paralympic Gold, Silver and Bronze medallist teams from around the globe to compete at the inaugural staging of the Wheelchair Rugby Quad Nations. Taking place from 9th – 11th March 2018 at the newly built 2400 seat Leicester Arena, the Wheelchair Rugby Quad Nations is an international tournament that will feature four teams all ranked within the top 5 in the World. As reigning European Champions Great Britain will be looking to capitalise on home court advantage as they take on the World’s very best. Ranked number 1 in the World, Australia are the two-time Paralympic Gold medallists and reigning World Champions, they will be joined by their fellow Rio finalists and number 2 ranked USA who won the Silver medal in Rio and are the most successful team in the sports 40-year history. 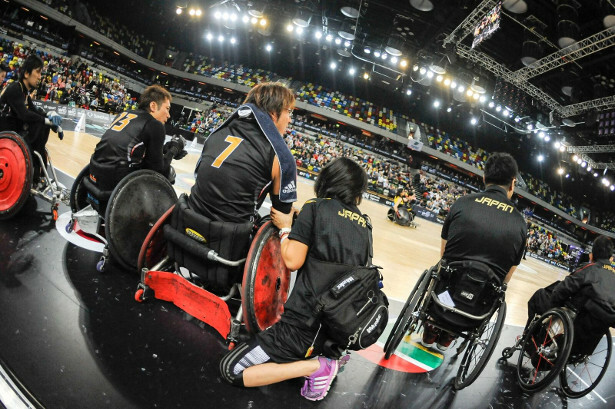 Completing the line-up will be Japan who were the Bronze medallists in Rio and currently ranked number 3 in the World – they will be looking to build on their first ever Paralympic Wheelchair Rugby medal as they look towards hosting the Paralympics in 2020. King Power – the world’s seventh biggest Duty-Free retailer – has strongly established links in Leicestershire sport, as owners of Premier League football club Leicester City since 2010. King Power CEO Aiyawatt Srivaddhanaprabha said: “We’re extremely proud to support the inaugural Quad Nations tournament and to continue to promote the development of world-class sport in Leicester. One of the only full-contact disability sports, Wheelchair Rugby is played by two teams of four who aim to score by carrying the ball across the opposing team’s line. Players compete in specially-designed manual wheelchairs and must meet minimum disability criteria classifiable under the sport classification rules. Games in Sydney, Australia and has since been an integral part of the games. It was also played as part of the 2017 Invictus Games, a parasport event for wounded, injured or sick armed services personnel. All four teams will play each other over the first two days before the pool leaders go forward to the Sunday final and the 3rd and 4th place fight it out for the Bronze medal. The tournament will be sanctioned by the International Wheelchair Rugby Federation (IWRF) who consider Leicester to be the ideal host city for the event due to its rich sporting heritage and the continued success of Leicester City Football Club and Leicester Tigers Rugby team. The official line up for the Team GB includes Jonathan Coggan, Ryan Cowling, Myles Pearson, Chris Ryan, Ayaz Bhuta, James Roberts, Aaron Phipps, Stuart Robinson alongside Nicholas Cummins, Muhammed Islam, Gavin Walker, and Jamie Stead all of whom play for the Leicester Tigers’ own Wheelchair Rugby team. The Wheelchair Rugby Quad Nations tournament will take place 9th – 11th March 2018 at the Leicester Arena with daytime and evening sessions over 3 days. 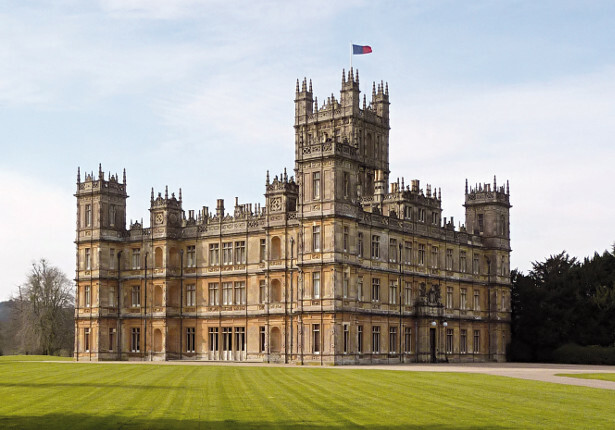 Industry charity, Hospitality Action is offering the exclusive opportunity to explore Highclere Castle in West Berkshire on Thursday 12th April. The tour of the stunning country house, which was the main filming location for the award-winning TV period drama, Downton Abbey, will be preceded by a champagne reception and lunch at The Vineyard at Stockcross and followed by afternoon tea at the same venue. Tickets are just £95 and all funds raised will go to the charity, which provides a lifeline for current and former hospitality industry workers who find themselves in a crisis, both at work and in their personal lives. Prior to the tour, guests will enjoy a Champagne reception followed by a fabulous three-course lunch in the Californian Suite at The Vineyard at Stockcross, a Relais & Châteaux 5 star hotel and spa, renowned for its impeccable service, 3 AA Rosette restaurant and award winning 30,000 bottle wine cellar. Guests will then have the opportunity to explore the castle at their leisure, including the Egyptian Exhibition before rounding off the day with a delicious afternoon tea back at The Vineyard. The Castle was the seat, 100 years ago, of the 5th Earl of Carnarvon, who famously discovered the Tomb of the Egyptian Boy Pharaoh, Tutankhamun, in 1922 with his archaeological colleague, Howard Carter. Today, the 8th Earl and Countess have opened a new Egyptian Exhibition throughout the cellars of the Castle to celebrate the 5th Earl’s achievements. Former England and Bath rugby player and renowned TV pundit, David ‘Flats’ Flatman, will entertain guests with his sporting tales and anecdotes at Hospitality Action’s inaugural Rugby Legends Dinner, sponsored by Sharp’s Brewery, on Monday 9th April at Deer Park Country House Hotel in Devon. Rugby legends including former England captain Phil Vickery MBE, former England player Jeremy Guscott, Welsh rugby union and Worcester Warriors scrum half Matt Powell and ex-England Rugby lock Nigel Redman will also be present. As will former England stars Alex Brown, Trevor Woodman and Andy Hazell, plus former England coach Jack Rowell OBE. The evening will include a delicious four course dinner prepared by seven award-winning South West chefs; Paul Ainsworth of Paul Ainsworth at Number 6, Dominic Chapman of The Beehive, Josh Eggleton of The Pony & Trap, Jude Kereama of Kota and Kota Kai, Nathan Outlaw of Restaurant Nathan Outlaw, Guy Owen of The Idle Rocks, and Michael Wignall formerly of Gidleigh Park. The menu features a delicate Smoked Fish Platter by Nathan Outlaw and a succulent Stuffed Saddle of Lamb, Beer Braised Onions, Pressed Potato, Wild Garlic and Mint Sauce by Josh Eggleton. The evening will be a fantastic opportunity to relax with industry colleagues in the glorious grounds of Deer Park Country House Hotel, as well as a chance to show your support for Hospitality Action. Wednesday, 21st February 2018: Today, ahead of the Ireland v Wales NatWest Six Nations fixture this weekend, Rugby Players Ireland and Zurich have launched a new App to promote a proactive approach to mental wellbeing as part of their Tackle Your Feelings campaign. Irish and Welsh international rugby players Rhys Ruddock and Rhys Priestland were on hand to lend their support to launch the Tackle Your Feelings App, which is available free to download through the Apple and Play App stores. The Tackle Your Feelings App aims to encourage users to be proactive about their mental wellbeing using sport psychology and positive psychology principles. It encourages users to prioritise their mental wellbeing in the same way as their nutrition and taking exercise, instead of waiting for a problem to manifest before taking action. Users are guided through an engaging ‘Training Camp’ programme, which will help to develop their self-awareness while offering a chance to try out different strategies to improve their mental and emotional wellbeing. As a key feature of the Tackle Your Feelings App a number of leading Irish international and provincial rugby players including Iain Henderson, Jack McGrath, and Bundee Aki have shared videos of their own tips and techniques, a unique insight into how they maintain their mental wellbeing and mentally prepare for rugby matches. Undoubtedly, many of these strategies will be employed as Ireland face Wales in one of the Championship’s most anticipated matches this Saturday, 24th February. Over 25 rugby players are using their profiles to support the new App and encourage people to take steps to prioritise their mental wellbeing. A nationwide campaign, Tackle Your Feelings aims to impart the message that people don’t need to be facing a challenge or crisis to work on their mental wellbeing. 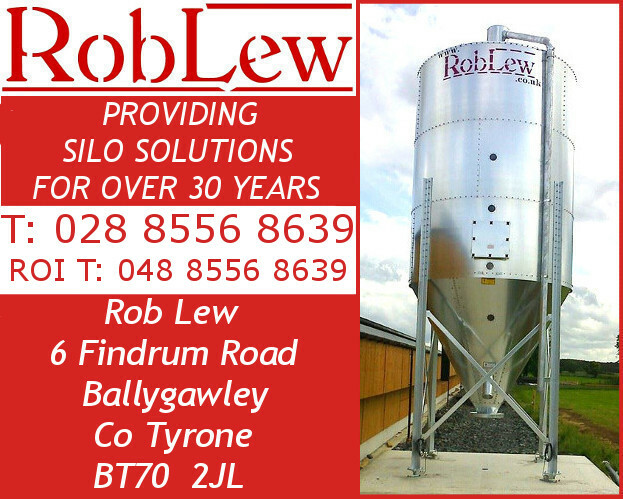 The campaign has previously seen provincial and international rugby stars including Leinster, Ireland and Lions front-row, Jack McGrath; Irish women’s player, Hannah Tyrrell; Ulster quartet Darren Cave, Craig Gilroy, Stuart McCloskey and Andrew Trimble; Connacht’s Jake Heenan; former Munster Scrum Half, Cathal Sheridan; former Irish international flanker Shane Jennings and former Connacht & current Bristol Rugby coach Pat Lam come forward to talk about their own personal mental wellbeing. 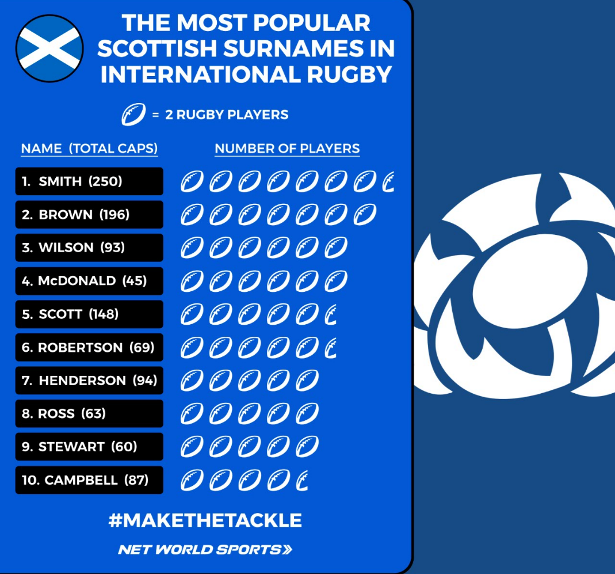 The most popular surnames of international rugby players have been revealed according to data collated by one of the country’s leading sports equipment suppliers. 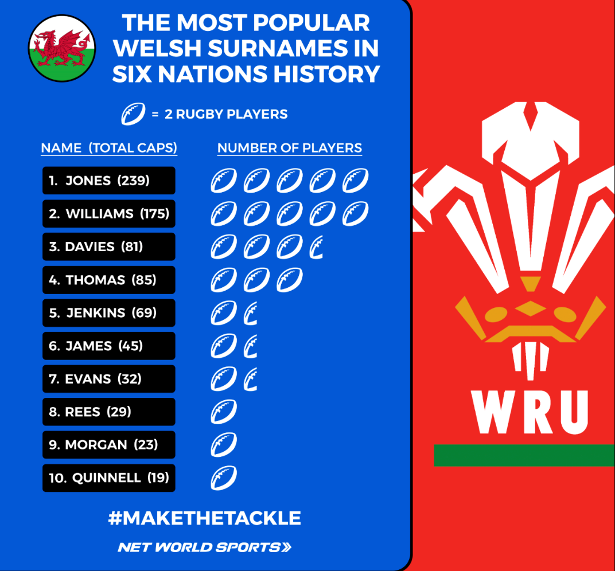 With the much-anticipated NatWest Six Nations Championship 2018 now under way, award-winning online retailer, Net World Sports, has analysed and ranked the surnames of every Welsh Six Nations rugby player since the Championship formed in 2000 and the most popular surnames in international rugby for all the home nations. In Wales, ‘Jones’ comes out on top, with players with the surname enjoying a total of 239 caps between them. A close second was ‘Williams’, who equalled ‘Jones’ for number of players with the surname (10), but could only muster up 175 caps. ‘Davies’ and ‘Thomas’ were nearly tied for the 3rd and 4th spots; ‘Davies’ kicking ‘Thomas’ off the park by a mere 4 caps. The wooden spoon was awarded to ‘Robinson’ who would finish at the foot of the Net World Sports table, receiving a total of only 5 caps split between 2 players. 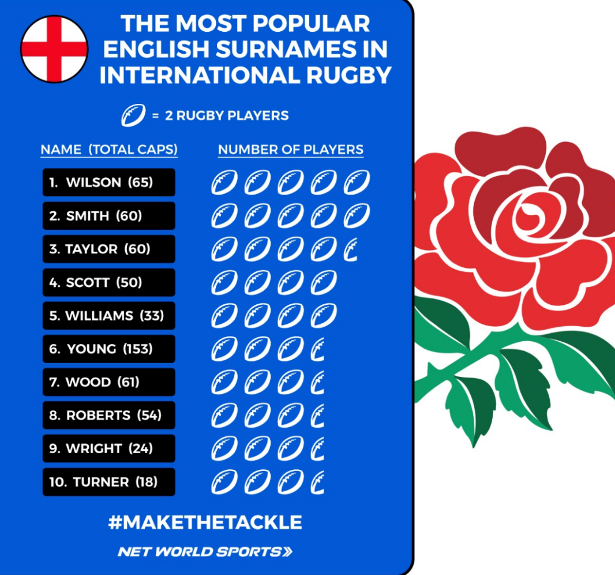 As well as analysing the surnames of Welsh Six Nation rugby players, the sports firm, which supplies a comprehensive range of rugby tackle pads, posts, balls and training equipment, also analysed the most popular surnames in international rugby for all the home nations. In Scotland, ‘Smith’ gains the most possession enjoying a total of 250 caps shared between 15 players. Close to charging down the Scottish top spot was ‘Brown’ who boasted an impressive 196 caps, again, shared between 14 players. Towards the rear of the field, ‘Ross’, ‘Stewart’ and ‘Campbell’ make up the final trio of the table scoring 63,60 and 87 caps respectively. Across the border and into England, ‘Wilson’ charges across the gain line with 10 players championing 65 caps between them. Providing support to the red rose campaign is ‘Smith’ and ‘Taylor’ who each share 60 caps from 10 and 9 players respectively. Tied from the middle of the field down are ‘Young, ‘Wood’, ‘Roberts’, ‘Wright’ and ‘Turner’ all of whom share 7 players with a total of 153, 61, 54, 24 and 18 caps respectively. 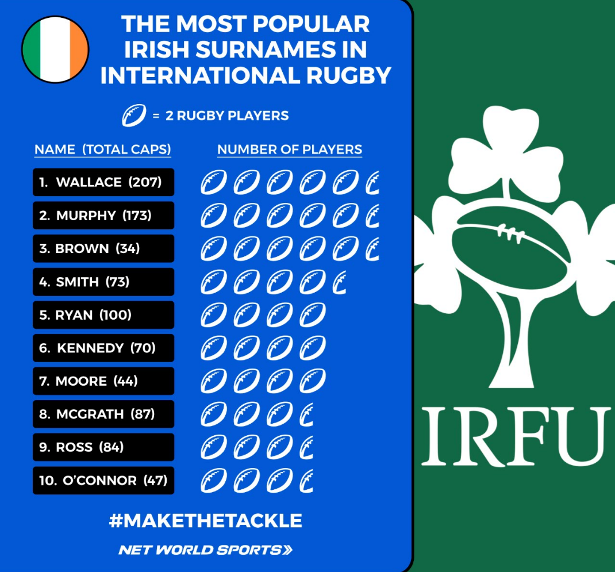 Across the North Sea and into Ireland, ‘Wallace’ takes dominance in the surname scrum boasting 207 caps shared between 11 players. ‘Murphy’ and ‘Brown’ tally up a close second, again enjoying 11 players, but falling short with only 173 and 34 caps respectively. Firmly in the second row of the table are a ‘McGrath’, ‘Ross’ and ‘O’Connor’ trio each tied with 7 players and a total of 218 caps between them. Founded in 2009, Net World Sports is a fast-growing online sports equipment retailer supplying an expanding range of quality products to customers worldwide. Headquartered at a 120,000 square foot base in Wrexham, North Wales, the company is currently ranked as the 2nd fastest-growing privately-owned business in Wales (45th in the UK) by the prestigious Sunday Times Virgin Fast Track 100 list, 43rd on the Sunday Times Lloyds SME Export Track 100 of firms with the fastest-growing international sales, and 66th on the Sunday Times BDO Profit Track 100 list of companies with the fastest-growing profits. It was awarded the ‘International Trading Business of the Year’ crown at the inaugural North Wales Business Leaders Awards 2017 while it was also a finalist in the 2016 National Business Awards. 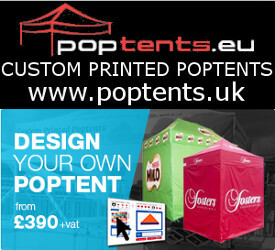 For further information visit www.networldsports.co.uk or contact (01691) 683807.